Globuar clusters come in all shapes and sizes. These large clusters of hundreds of thousands or millions of stars are sometimes dense and hard to resolve in the core; others are relatively sparse, even looking like open clusters. This image shows examples of both extremes. 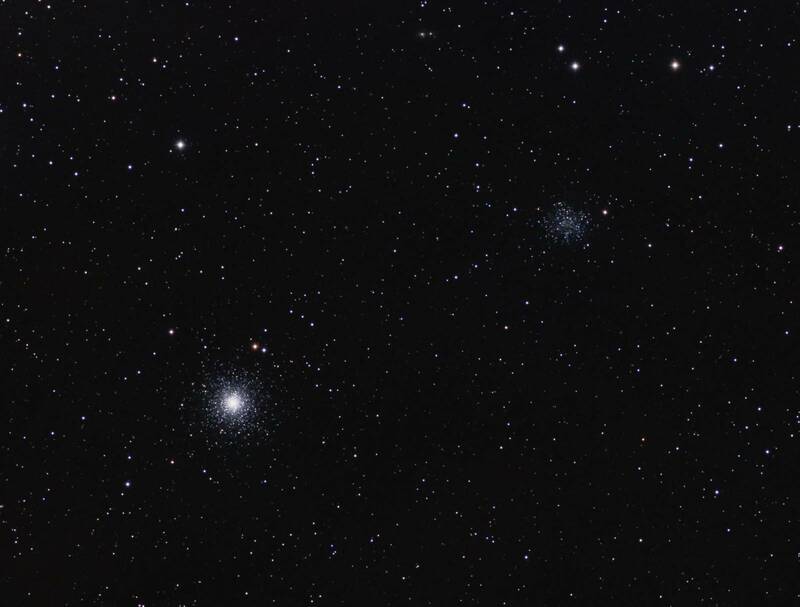 M53 (lower left) and NGC5053 both lie in Coma Berenices. 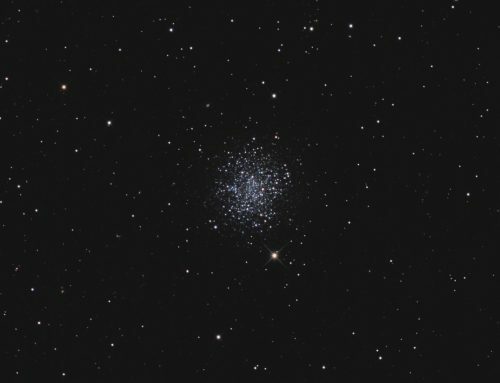 M53 has a densely packed core; NGC5053 is quite diffuse. They look very different even though they’re at similar distances from us. 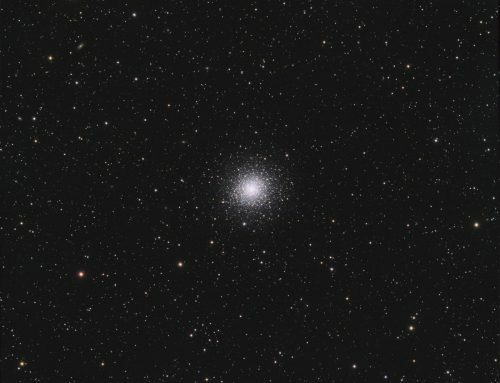 M53 lies about 58,000 light years from Earth, and contains a mass more than 86,000 times the mass of the Sun. It is a relatively ordinary globular cluster, compared to NGC5053. NGC5053 lies about 57,000 light years from earth. 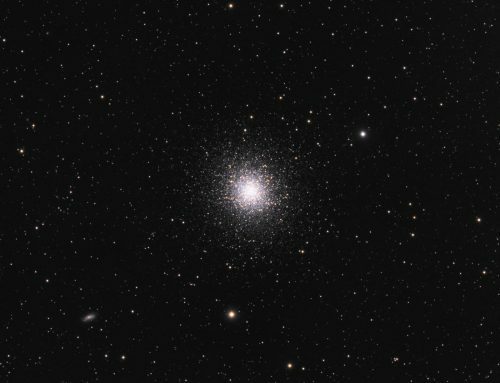 It contains far fewer stars than M53 – one estimate suggests it contains no more than 11,500 stars. NGC5053’s stars have very low metallicity, meaning a very low abundance of elements other than hydrogen and helium. 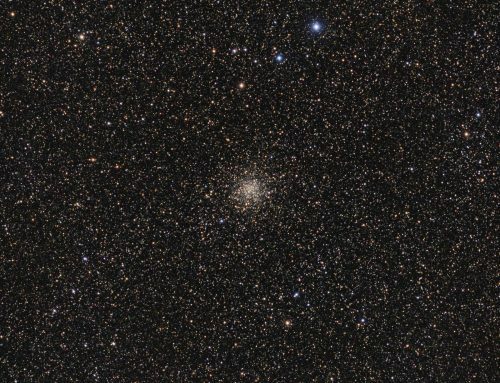 Its mix of stars resembles the Sagittarius Dwarf Galaxy much more than other Milky Way globular clusters, so it has been suggested that it originated from that dwarf galaxy. 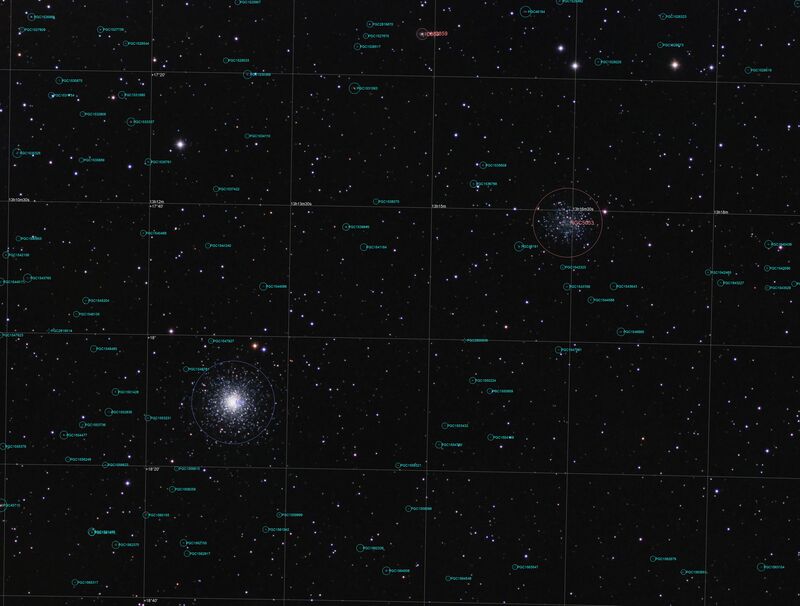 NGC5053 contains at least 22 RR Lyrae variable stars and 27 Blue Stragglers, many of which are also variable stars. Although this image doesn’t show it, there are reports of a tidal bridge between these two clusters, suggesting they have interacted with each other in the past. There are dozens of faint, distant galaxies far in the background in this image. They look like elongated or fuzzy stars. I have posted an annotated image that identifies some of them. Moravian G3-16200 EC camera (on loan from O’Telescope), Optolong R, G and B filters, Takahashi FSQ-106 ED IV at f/3.6, Paramount MX. Acquisition with the SkyX unguided. Focused with FocusMax. All pre-processing and processing in PixInsight. Acquired from my SkyShed in Guelph. No moon, average transparency and seeing. 12x5m R, 11x5m G and 11m B, unbinned frames (total=2hr50m). Creation and cleanup: The BatchPreProcessing script was used to perform calibration, cosmetic correction and registration of all frames. DrizzleIntegration was used to make the channel masters. The R, G and B masters were cropped and processed separately with DBE, and then combined to make an RGB image which was processed with ColorCalibration. Linear Noise Reduction: MultiscaleLinearTransform was used to reduce noise in the RGB image. Layer settings for threshold and strength: Layer 1: 5, 1.0 Layer 2: 3.5, 0.84 Layer 3: 2.5, 0.71 Layer 4: 1.0, 0.55 Layer 5: 1.5, 0.28 Layer 6: 1.0, 0.16. Creation and cleanup of SynthL: The linear R, G and B masters were combined using the ImageIntegration tool (average, additive with scaling, noise evaluation, iterative K-sigma / biweight midvariance, no pixel rejection). Deconvolution: A star mask was made to use as a local deringing support image. A copy of the image was stretched to use as a range mask. Deconvolution was applied (80 iterations, regularized Richardson-Lucy, external PSF made using DynamicPSF tool with 30 stars). Linear Noise Reduction: MultiscaleLinearTransform was used to reduce noise in the background areas of the synthL file. Layer settings for threshold and strength: Layer 1: 5, 1.0 Layer 2: 3.5, 0.84 Layer 3: 2.5, 0.71 Layer 4: 1.0, 0.55 Layer 5: 1.5, 0.28 Layer 6: 1.0, 0.16. Dynamic Range Compression: HDRMultiscaleTransform was applied (6 layers) to the core of the globular using a heavily blurred range mask. Noise Reduction and Re-Stretch: TGVDenoise was applied in L*a*b* mode with 300 iterations with a range mask used to protect high signal areas. This was followed by a HistogramTransformation to raise the black point (but with no clipping). The processed SynthL was applied to the RGB image using LRGBCombine. Final Steps: Background, galaxy and star brightness, contrast and saturation were adjusted in several iterations using Curves with masks as required.